. . I came home from work yesterday, and there in the mail was a small package. . No, I still haven't gotten my invitation to the Royal wedding (and if I don't get it soon, I'm bringing those tea towels and that can open back to the store for a refund and I'll just spend that wedding gift money on myself). . . 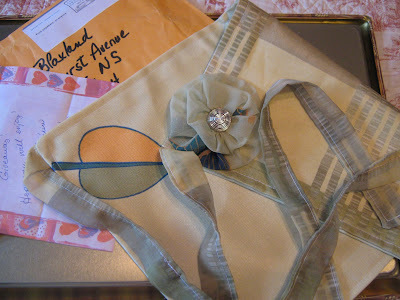 I received a gorgeous little "half" cocktail apron just for entering a giveway hosted by France at Passion of Milkglass Collecting. It's gorgeous front and back, and the button flower detail is so sweet. . Now I just have to make me some cocktails! Perhaps this weekend. . I'm a very lucky girl! Thank you France. I loved it. And she has an absolutely wonderful collection of milk glass. She's been a lucky girl too. 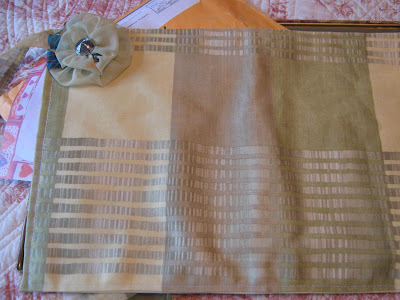 . . mcmcmcmc And don't forget to enter my giveaway. Details are at the top right corner of my blog screen. . .
That is so darn cute!!!!! I'm sure you'll look great in it as you attend the Royal Wedding! I haven't gotten my invitation yet either. I hope I'm not being snubbed. That France is so sweet! I love your apron! So cute! Have a little royal drink for me! Now you'll have to throw a half-cocktail party! Here's sendin' ya a great big old Hillbilly CONGRATULATIONS shout out girl!!! What a great win and I bet you'll be the cutest little hostess with the mostess on the block!! !